Roo dreams of bouncing as well as Tigger someday. He's mischievous, energetic, and fearless, but grows uneasy when Tigger is not around. He hopped onto the screen in "Winnie the Pooh and the Honey Tree" (1966). A feisty kangaroo who's full of energy. Little Roo wants to learn to bounce as high as Tigger. The youngest resident of the Hundred Acre Wood. Roo looks up to Tigger, and dreams of bouncing just like him someday. Kanga's son. He loves Tigger, and the two spend lots of time practicing their bouncing together. Roo was the first in the Hundred Acre Wood to befriend Lumpy. Roo is one of the characters residing in the 100 Acre Wood, and the son of Kanga. He appears in Kingdom Hearts, Kingdom Hearts Chain of Memories and Kingdom Hearts II. Whenever he goes out with his mother, he goes inside her pouch. Roo is never seen alone; he is always found with either Kanga or Tigger (whom he idolizes from their shared love of bouncing). Roo appears in many of the mini-games in 100 Acre Wood. The games he shows up in are Tigger's Giant Pot, Pooh's Muddy Path, Balloon Bounce, and The Exposition. In Kingdom Hearts, he is a big help in the Bouncing Spot page area where he helps Sora by catapulting him into the trees to get special items or Rare Nuts for Owl and he helps Sora with advice with Tigger's challenges. Roo is one of Pooh's friends that he is looking for. Roo is one of Pooh's friends that must be found for Sora to complete the 100 Acre Wood. Roo is seen with Kanga and Tigger and also helps Sora with the others find Pooh in the Spooky Cave. Roo is a playful, curious, happy-go-lucky joey who can be quite a handful at times. Unlike Piglet, his size does not inhibit his self-confidence. Roo is strongly determined as evidenced in his time spent furthering his bouncing abilities. Roo loves to get himself in trouble, but always learns a lesson from his mistakes. Roo is amazingly optimistic and enthusiastic as shown in the search for Pooh. He has great admiration for Tigger, who he views as the epitome of bouncing and dreams of bouncing just like him someday. Roo is a joey whose height is similar to Piglet's. Roo has light brown fur and an upturned tail. The pads of his feet are a light pink, along with the inside of his ears. He has beady, black eyes and thin eyebrows. He also has a small nose and black mouth. His only attire is a sky blue T-shirt that he wears all the time. Finally, Roo sports two strands of black hair on the top of his head. 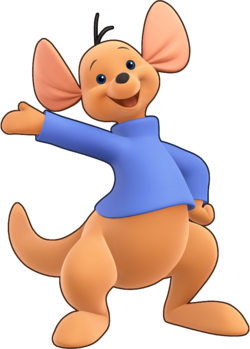 Roo made his Disney debut in the 1966 film, Winnie the Pooh and the Honey Tree. He is inspired by the character from A.A. Milne's 1929 book Winnie-the-Pooh.